We introduce an approach to evaluate the cytosolic Ca2+ concentration in isolated lymphatics to study Ca2+-dependent and Ca2+-sensitizing mechanisms of lymphatic smooth muscle contraction. Souza-Smith, F. M., Kurtz, K. M., Breslin, J. W. Measurement of Cytosolic Ca2+ in Isolated Contractile Lymphatics. J. Vis. Exp. (58), e3438, doi:10.3791/3438 (2011). Lymphatic vessels comprise a multifunctional transport system that maintains fluid homeostasis, delivers lipids to the central circulation, and acts as a surveillance system for potentially harmful antigens, optimizing mucosal immunity and adaptive immune responses1. Lymph is formed from interstitial fluid that enters blind-ended initial lymphatics, and then is transported against a pressure gradient in larger collecting lymphatics. Each collecting lymphatic is made up of a series of segments called lymphangions, separated by bicuspid valves that prevent backflow. Each lymphangion possesses a contractile cycle that propels lymph against a pressure gradient toward the central circulation2. This phasic contractile pattern is analogous to the cardiac cycle, with systolic and diastolic phases, and with a lower contraction frequency4. In addition, lymphatic smooth muscle generates tone and displays myogenic constriction and dilation in response to increases and decreases in luminal pressure, respectively5. A hybrid of molecular mechanisms that support both the phasic and tonic contractility of lymphatics are thus proposed. Contraction of smooth muscle is generally regulated by the cytosolic Ca2+ concentration ([Ca2+]i) plus sensitivity to Ca2+, of the contractile elements in response to changes in the environment surrounding the cell6. [Ca2+]i is determined by the combination of the movement of Ca2+ through plasma membrane ligand or voltage gated Ca2+ channels and the release and uptake of Ca2+ from internal stores. Cytosolic Ca2+ binds to calmodulin and activates enzymes such as myosin light chain (MLC) kinase (MLCK), which in turn phosphorylates MLC leading to actin-myosin-mediated contraction8. However, the sensitivity of this pathway to Ca2+ can be regulated by the MLC phosphatase (MLCP)9. MLCP activity is regulated by Rho kinase (ROCK) and the myosin phosphatase inhibitor protein CPI-17. Here, we present a method to evaluate changes in [Ca2+]i over time in isolated, perfused lymphatics in order to study Ca2+-dependent and Ca2+-sensitizing mechanisms of lymphatic smooth muscle contraction. Using isolated rat mesenteric collecting lymphatics we studied stretch-induced changes in [Ca2+]i and contractile activity. The isolated lymphatic model offers the advantage that pressure, flow, and the chemical composition of the bath solution can be tightly controlled. 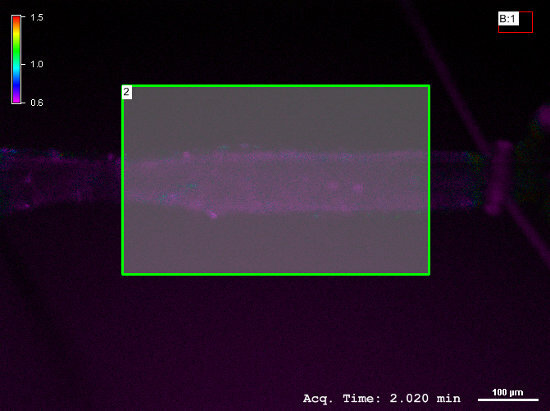 [Ca2+]i was determined by loading lymphatics with the ratiometric, Ca2+-binding dye Fura-2. These studies will provide a new approach to the broader problem of studying the different molecular mechanisms that regulate phasic contractions versus tonic constriction in lymphatic smooth muscle. All procedures were approved by the Institutional Animal Care and Use Committee at the Louisiana State University Health Sciences Center and were performed in accordance with the guidelines of the National Institute of Health (NIH publication No. 85-12, revised 1996). Male Sprague-Dawley rats (Charles River Laboratories, 270-350 g body wt) were housed in a controlled temperature (22 °C) and controlled illumination (12:12 h light dark cycle) environment. After arrival, the rats were submitted to a one-week acclimation period and were provided standard rat chow (2018 Teklad Global 18% Protein Rodent Diet, Harlan) and water ad libitum. Glass micropipettes for mounting lymphatics are made from Borosilicate Glass with filament OD 1.2mm, ID 0.69mm (Sutter Instrument BF 120-69-15). Pull the pipettes using a Flaming/Brown Micropipette Puller model P-97 (Sutter Instrument) and are bevel with a Micro Grinder EG 400 (Narishige) to obtain a beveled tip with a ~60 μm outer diameter. Mount the micropipettes in the isolated vessel chamber (model CH-1, Living Systems, Burlington, VT). The pipettes should be resistance matched (same size opening). Fill the chamber (5 mL) and micropipettes with albumin-physiological salt solution (APSS, see Table 1). Make sure there are no bubbles in the micropipettes or the tubing. Prepare overhand knots with ophthalmic sutures and place one on each micropipette. Anesthetize the animals with an intramuscular injection of ketamine/xylazine (90 and 9 mg/kg, respectively), using a BD syringe (1 ml) and needle (BD intradermal bevel 26G3/8). Spray the abdomen area with 70% alcohol to sterilize, perform a midline laparotomy, and exteriorize and excise the small intestine and mesentery. Place the tissue in ice-cold APSS. Euthanize the animals with an overdose of ketamine/xylazine and confirm death by opening the chest (as per American Veterinary Medical Association guidelines on euthanasia). Pin a section of mesentery in a dissection chamber filled with ice-cold APSS. Carefully dissect a collecting lymphatic vessel (80-200 μm internal diameter and 1-2 mm of length) from surrounding adipose and connective tissue with the aid of a stereomicroscope. Use dissecting Dumont forceps-INOX 55 (Fine Science Tools #11255-20) and dissecting spring scissors (Fine Science Tools #15000-03). Use isolated vessels with only one valve to ensure optimal pressure control in the entire segment during the experiment. Transfer the isolated lymphatic to the isolated vessel chamber containing 5 ml of APSS. Mount the vessel onto the two resistance-matched glass micropipettes by tying with the ophthalmic sutures. Transfer the chamber to a inverted fluorescent microscope (ours is a Nikon TE-2000U) equipped with a xenon lamp (Sutter Instruments Lambda LS2 300 W), 340/380 filter wheel system (Sutter Lambda 10-3 with Chroma Technology 340 and 380 nm excitation filters), 510 nm dichroic emitter (Chroma Technology D510/80m), a sensitive CCD camera (Photometrics HQ2), and software for acquisition (Nikon Elements AR) (Figure 1). Attach the tubing originating from the micropipettes either to adjustable reservoirs or to the servo-feedback pump system (Living Systems Instrumentation, Burlington VT), both which can be used to alter pressure and flow. Connect the chamber to the heating unit (Living Systems) and set the bath to 37 °C. View the lymphatic directly through the coverslip in the base of the chamber with a 10X objective (Nikon Plan Fluor 10x/0.3, DIC L/N1, ∞/0.17, WD 16.0). Rapid time-lapse image sets can be acquired using the image acquisition software (our system has Nikon Elements AR software). [Ca2+]i in the isolated lymphatic smooth muscle is measured by the Ca2+-sensing dye Fura 2-acetoxymethyl ester (AM) (Molecular Probes, Eugene, OR). Load the lymphatic vessel with Fura-2 AM by exchanging the bath to APSS solution containing Fura-2 AM (2 μM) and pluronic acid (0.2 % wt/vol) for 30 minutes at 37 °C. After 30 minutes change the bath back to APSS solution. Rinse 2 times to wash out the Fura-2 from the bath solution. Leave the vessel for an equilibration time of at least 20 min before [Ca2+]i measurements to allow re-establishment of spontaneous contractions. Collect ratiometric Fura-2 measurements in isolated lymphatics with an acquisition protocol that alternatively illuminates at 340 and 380 nm wavelengths for durations of 50 ms each. The fluorescent light passes through a dichroic mirror (400 nm; Chroma Technology Corp. 400DCLP) and a wide band emission filter (510 nm, 80 nm band width; Chroma Technology Corp. D510/80m) and is acquired by the Photometrics HQ2 camera. We collect 2 minutes of data at a baseline intraluminal pressure of 2 cm H2O and during step increases of +2, +4, +6, +8, and +10 cm H2O. To analyze the average [Ca2+]i, draw a region of interest (ROI) that includes the entire lymphatic vessel and surrounding area so that the vessel is fully tracked during relaxation and contraction (Figure 2). If either micropipette is in the field of view these areas should not be included in the ROI. 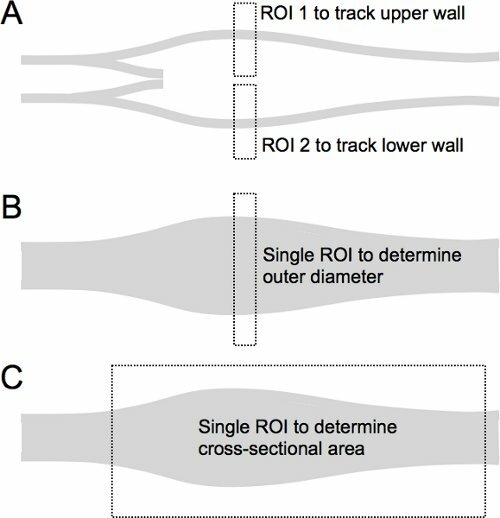 Smaller ROIs can also be chosen, however a potential problem with small ROIs is that the vessel walls may move slightly in the longitudinal direction out of the ROI as the vessel constricts and relaxes. Another potential problem is that some vessels twist during contraction, and these lymphatics should not be used for study. The twisting motions are usually avoided by limiting the length of the isolated lymphatic to <1 mm. In addition, sometimes segments on either side of a valve do not constrict/relax in synchrony. In this case, because these segments represent separate functional lymphangions, the lymphatic should be studied on only one side of the valve, or each lymphangion can be studied separately with an ROI placed on either side. When using a 10X objective, the vessel walls should stay in focus during phasic contractions, however if there are any parts of the walls that go out of focus during contractions these areas should not be included in the ROI. A background ROI is also used and should be placed far from the vessel (e.g. in the corner of the image). An increase in the 340/380 ratio indicates an increase in [Ca2+]i. Luminal diameter at various time points can also be measured using the software's measure function or by tracking the vessel walls over time (see section 6). To study pressure independent of imposed flow, the same pressure must be applied to each micropipette by the servo-null feedback pump. The tubing from each micropipette is attached via a T-connector to common tubing mounted on the pump. Initially set the intraluminal pressure at 2 cm H2O for 45-60 min., which is enough time to allow the development of lymphatic spontaneous contractions. For study use only vessels that meet the following criteria within the equilibration period: (1) the vessel develops spontaneous tone at 2 cm H2O, (2) the vessel develops regular, spontaneous contractions that are reasonably uniform across the length of the vessel. Often the area downstream from a valve constricts more than the rest of the vessel, and these vessels will be used as long as there is evidence that the remainder of the vessel displays contractile activity. Record the rapid time-lapse images during the pressure step procedure. For each, pressure will start at 2 cm H2O for 30 s, and then is raised in a step by +2, +4, +6, +8, or +10 cm H2O for one minute, and lowered back to 2 cm H2O for 30 s.
After completion of the pressure step series, change the bath solution to a Ca2+-free APSS at 37 °C to measure the maximal passive diameter (MaxD) and Ca2+-fluorescence measurements at each of the above luminal pressures. The MaxD is used to calculate tone and normalize data between lymphatics of different sizes. Changes in vessel diameter over time can be determined using object tracking tools in most image analysis software packages. This can be achieved by using only one of the channels (we use the 340 nm channel but the 380 channel could also be used). A contrast threshold is applied to the image stack so that the vessel walls are highlighted, and then ROIs encompassing each wall are drawn to track them over time (Figure 3A). The internal diameter can be determined by measuring the centroid of each wall and calculating the distance between the two centroids, minus half of the thickness of each wall. A second option when it is difficult to track each wall due to a strong signal in the luminal area is to measure external diameter, and use a correction factor based on a static measurement of the vessel walls to obtain internal diameter. In this case, the ROI spans the entire vessel and the outer diameter is tracked (Figure 3B). This method can also be used to determine the entire viewable cross sectional area of the lymphatic (Figure 3C). Because of the typical shape of a lymphangion, this latter option can provide a better estimate of the actual volume of fluid pumped with each contraction than using diameter in a selected part of the vessel. Contraction frequency (CF), determined by counting the number of phasic contractions per minute. End diastolic diameter (EDD), which is the diameter just prior to a phasic contraction. End systolic diameter (ESD), the diameter at the end of a phasic contraction. Amplitude of contraction (AMP = EDD-ESD), a simplified index of the stroke volume. The maximal passive diameter at each pressure (MaxD; determined in Ca2+-free conditions), which can be used to determine the tone generated by the lymphatic smooth muscle, and is also used to normalize data between lymphatics of different diameter, or the same lymphatic studied at different luminal pressures. EDD1 , which is the EDD associated with the first contraction after a pressure step. This is used as a starting point when determining myogenic constriction of a lymphatic vessel in response to a step increase in luminal pressure5. Myogenic constriction of an isolated lymphatic after a pressure step is represented by the normalized change in EDD following a pressure step increase = 100*(EDD - EDD1)/MaxD. Volume Flow Index (VFI) = CF x SVI. At the beginning of each phasic contraction, there was a transient increase in [Ca2+]i (Figure 4). 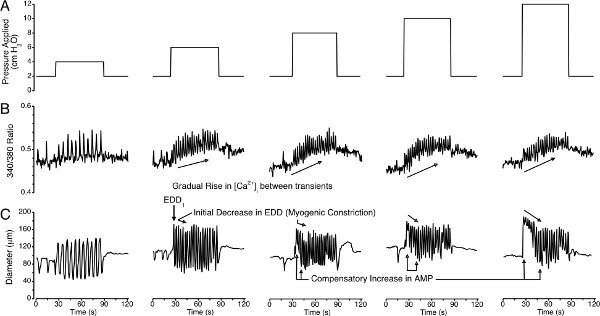 In addition, after step increases in luminal pressure, the frequency of Ca2+ transients and phasic contractions increased in synchrony. These observations are similar to a previous finding using thoracic ducts mounted on a wire myograph14 and support previous data indicating a central role for oscillatory Ca2+ release from internal stores in the mechanism underlying the phasic contractile cycle15. We also investigated whether [Ca2+]i during diastole (between the Ca2+ transients and phasic contractions) is associated with the lymphatic tone and myogenic constriction caused by stretch when step increases in pressure are imposed (Figure 5). 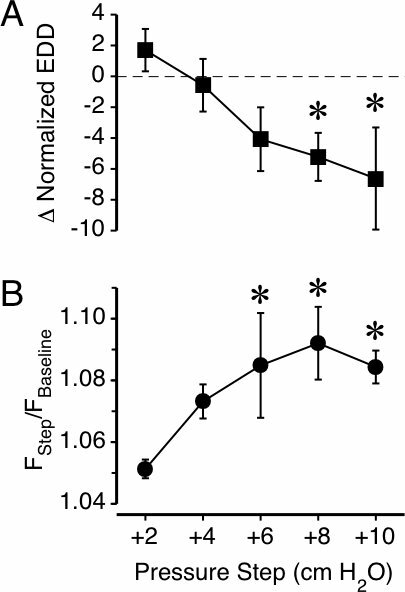 Immediately after step increases in pressure of +4 cm H2O and higher, [Ca2+]i during diastole steadily increased, compared to baseline prior to the pressure step (Figure 5B). In addition, after the initial increase in diameter due to the step increases in pressure (EDD1), there was myogenic constriction (Figure 5C), defined as a decrease in EDD from EDD1 in previous reports5,12. When comparing the mean normalized change in EDD among the different pressure steps, there was significantly more constriction after increases of +8 and +10 cm H2O compared to +2 cm H2O (Figure 6A). The steady rise in [Ca2+]i was also related to pressure, with the step increases of +6, +8, and +10 cm H2O causing significantly higher changes in Ca2+ than +2 cm H2O (Figure 6B). However, the pressure step-Ca2+ relationship appears to plateau at these pressures as well. These results suggest that a Ca2+-dependent mechanism is associated with lymphatic myogenic constriction in response to stretch. However, the plateau in the pressure step-Ca2+ relationship suggests a mechanism that increases Ca2+ sensitivity may also contribute to the increased myogenic constriction at the higher pressure steps. Figure 1. Schematic of the microscope system used for measurement of [Ca2+]i in an isolated lymphatic. The isolated lymphatic chamber is placed on the stage of the inverted microscope. The specimen is illuminated alternatively at 340 and 380 nm, and the fluorescent signal emitted by the lymphatic is collected with a CCD camera and stored in a personal computer. 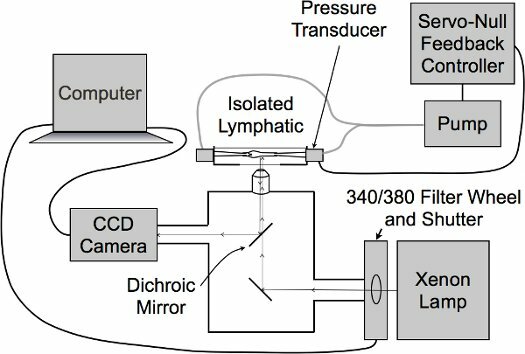 The intraluminal pressure of the lymphatic is controlled by a servo-null feedback system. The user sets the pressure for the system, and the pressure transducers in-line with the lymphatic relay the intraluminal pressure to the feedback system, which can dynamically raise or lower pressure via a pump. Figure 2. Example of Region of Interest (ROI) selection for Fura-2 ratiometric imaging studies in isolated lymphatic vessels. The region selected includes most of the vessel (excluding areas touching the micropipettes) and surrounding area to ensure the vessel will be tracked for the entire time course. A background ROI (top right corner) is also used to eliminate nonspecific signal from the surrounding bath. Figure 3. Methods for tracking lymphatic pumping. A. Internal diameter can be determined over time using ROIs that track movement of the vessel walls. B. When the contrast threshold is set to include the entire vessel, the outer diameter can be tracked with a single ROI. Internal diameter can be estimated from these measurements by correcting for wall thickness. C. Another option is to track the area encompassed by the vessel, which can be used to calculate volume by correcting for wall thickness and assuming the lymphatic has cylindrical geometry. Figure 4. Relationship between [Ca2+]i and lymphatic diameter. A. Representative images from a time-lapse video of Fura-2 intensity (heat map format) in an isolated lymphatic. The arrows in each image outline the outer diameter of the vessel. Image 1 shows the lymphatic during diastole, with relatively low [Ca2+]i. In image 2, the intensity of the 340/380 ratio increases in the vessel walls, just prior to the phasic contraction that occurs in images 3-5. By image 4, the Ca2+ transient has ended, and by image 5, the systolic phase has ended and the vessel is returning to its resting state. B. A plot of [Ca2+]i and lymphatic luminal diameter shows that a transient increase in [Ca2+]i occurs just prior to each phasic contraction. Figure 5. Changes in lymphatic [Ca2+]i and the lymphatic contractile cycle in response to step increases in pressure. The pressure step protocols (A), 340/380 ratio data, representing [Ca2+]i (B), and changes in lymphatic diameter over time (C) are shown. A. Baseline luminal pressure was 2 cm H2O and the lymphatic vessel was subjected to step increases of +2, +4, +6, +8, and +10 cm H2O. The time interval between each pressure step recording was 1-2 min. Each pressure step caused an increase in both the frequency of transient increases in [Ca2+]i (B) and phasic contractions (C). Lymphatic diameter also increased with each step increase in luminal pressure, and for the +4 to +10 cm H2O pressure steps, there was a initial decrease in the EDD that occurred after EDD1 (C), previously described as lymphatic myogenic constriction. There was also a steady increase in the basal [Ca2+]i between transients immediately after each step increase in pressure (B). The myogenic constriction was more pronounced with the larger pressure steps, however the increase in basal [Ca2+]i was approximately the same for the +4 to +10 cm H2O pressure steps (B). A previously reported compensatory increase in AMP was also apparent after the pressure steps of +6 to +10 cm H2O (C). Figure 6. Lymphatic myogenic constriction and the gradual increase in free [Ca2+]i during diastole, shortly after step increases in pressure. A. The average EDD between 30-50 s after the EDD1 is used to calculate the change in normalized EDD for each pressure step. B. The intensity of the 340/380 ratio 30-50 s after the EDD1 was divided by the average 340/380 ratio during baseline (2 cm H2O). *P<0.05 vs. the +2 cm H2O pressure step. N=4 vessels studied. Movie 1. Example of phasic contractions in an isolated lymphatic vessel used for study. The luminal pressure was set at 2 cm H2O. The elapsed time and a scale bar are shown at the bottom. The time-lapse images were collected with a 10X objective using transmitted light. Click here to watch the movie. Movie 2. Ratiometric Fura-2 imaging in a pumping isolated lymphatic. A heat map scale is shown at the top left and the elapsed time and scale bar are shown at the bottom. The pressure was initially set at 2 cm H2O and was raised to 8 cm H2O starting at 0.5 min and returned to 2 cm H2O at 1.5 min. Click here to watch the movie. A novel combination of methods was employed to study intrinsic pumping of lymphatic vessels. The ability to simultaneously measure changes in [Ca2+]i and diameter in pumping lymphatics will allow for studies of the relative contributions of Ca2+-dependent and Ca2+-sensitizing signaling pathways in the overall mechanism governing the lymphatic contractile cycle. The lymphatic contractile cycle consists of phasic contractions superimposed over tone. The data show that each phasic contraction is associated with a transient rise in [Ca2+]i, suggesting a central role of Ca2+ in the pacemaking mechanism, and that the frequency of Ca2+ transients is sensitive to changes in luminal pressure. Our data also show that rapid increases in pressure can elicit a steady rise in the basal [Ca2+]i between transients. This rise may contribute to the myogenic constriction that is observed in collecting lymphatics following step increases in luminal pressure. However, we observed a plateau of the increases in this basal [Ca2+]i with pressure steps ranging from +6 to +10 cm H2O, which had varying degrees of myogenic constriction. This data suggests that another mechanism, possibly a Ca2+-sensitizing mechanism, is also involved in the myogenic response to pressure. One assumption with these studies is that the majority of the measured Ca2+ is contained in smooth muscle. However, Ca2+ in endothelial cells and other cell types that may be present in the lymphatics also contribute to the overall observed [Ca2+]i, therefore the measured values are probably an overestimate of smooth muscle [Ca2+]i in lymphatics. Any Ca2+ measured from the endothelium is not expected to directly contribute to smooth muscle contraction based on previous studies in arterioles16. This issue will be addressed in future experiments in which the lymphatics are denuded of endothelium. When using ratiometric dyes to assess [Ca2+]i in cells or tissues, movement of the specimen can cause artifacts. To minimize movement artifacts in contracting lymphatics, we utilized an ROI that includes as much of the vessel as possible to determine 340/380 ratios. We also only study vessels that stay in focus during their contractile cycle. Because of potential artifacts that may arise from vessel movement, rather than determine the absolute [Ca2+]i at a particular site, we obtain the average for a large area of the vessel. We focus on the relative changes in the average [Ca2+]i over time and how these changes relate to phasic and tonic contraction of the vessels. In summary, determination of changes in [Ca2+]i by ratiometric imaging in isolated collecting lymphatics represents a powerful tool to decipher the Ca2+-dependent and Ca2+-sensitizing mechanisms underlying the lymphatic contractile cycle. With this method, future studies utilizing selective agonists or inhibitors of various signal transduction pathways will also help differentiate the unique molecular mechanisms underlying phasic versus tonic contraction in lymphatic smooth muscle. This work was supported by NIH grant P20RR018766 and a grant from the ABMRF/Foundation for Alcohol Research. Chakraborty, S. Lymphatic system: a vital link between metabolic syndrome and inflammation. Ann. N. Y. Acad. Sci. 1207, Suppl 1. 94-94 (2010). Zawieja, D. Lymphatic biology and the microcirculation: past, present and future. Microcirculation. 12, 141-141 (2005). Benoit, J. N., Zawieja, D. C., Goodman, A. H., Granger, H. J. Characterization of intact mesenteric lymphatic pump and its responsiveness to acute edemagenic stress. Am. J. Physiol. 257, H2059-H2059 (1989). Davis, M. J., Davis, A. M., Ku, C. W., Gashev, A. A. Myogenic constriction and dilation of isolated lymphatic vessels. Am. J. Physiol. Heart. Circ. Physiol. 296, H293-H293 (2009). Dougherty, P. J., Davis, M. J., Zawieja, D. C., Muthuchamy, M. Calcium sensitivity and cooperativity of permeabilized rat mesenteric lymphatics. Am. J. Physiol. Regul. Integr. Comp. Physiol. 294, R1524-R1524 (2008). Fay, F. S., Shlevin, H. H., Granger, W. C., Taylor, S. R. Aequorin luminescence during activation of single isolated smooth muscle cells. Nature. 280, 506-506 (1979). Wang, W. Inhibition of myosin light chain phosphorylation decreases rat mesenteric lymphatic contractile activity. Am. J. Physiol. Heart. Circ. Physiol. 297, 726-726 (2009). Karaki, H. Calcium movements, distribution, and functions in smooth muscle. Pharmacol. Rev. 49, 157-157 (1997). Ratz, P. H., Berg, K. M., Urban, N. H., Miner, A. S. Regulation of smooth muscle calcium sensitivity: KCl as a calcium-sensitizing stimulus. Am. J. Physiol. Cell. Physiol. 288, C769-C769 (2005). Somlyo, A. P., Somlyo, A. V. Ca2+ sensitivity of smooth muscle and nonmuscle myosin II: modulated by G proteins, kinases, and myosin phosphatase. Physiol. Rev. 83, 1325-1325 (2003). Souza-Smith, F. M., Kurtz, K. M., Molina, P. E., Breslin, J. W. Adaptation of mesenteric collecting lymphatic pump function following acute alcohol intoxication. Microcirculation. 17, 514-514 (2010). Breslin, J. W., Yuan, S. Y., Wu, M. H. VEGF-C alters barrier function of cultured lymphatic endothelial cells through a VEGFR-3-dependent mechanism. Lymphat. Res. Biol. 5, 105-105 (2007). Shirasawa, Y., Benoit, J. N. Stretch-induced calcium sensitization of rat lymphatic smooth muscle. Am. J. Physiol. Heart. Circ. Physiol. 285, H2573-H2573 (2003). Imtiaz, M. S. Pacemaking through Ca2+ stores interacting as coupled oscillators via membrane depolarization. Biophys. J. 92, 3843-3843 (2007). Muller, J. M., Davis, M. J., Kuo, L., Chilian, W. M. Changes in coronary endothelial cell Ca2+ concentration during shear stress- and agonist-induced vasodilation. Am. J. Physiol. 276, 1706-1706 (1999). 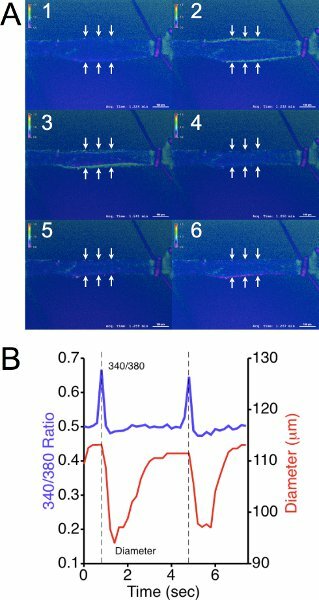 Ferrusi, I., Zhao, J., van Helden, D., von der Weid, P. Y. Cyclopiazonic acid decreases spontaneous transient depolarizations in guinea pig mesenteric lymphatic vessels in endothelium-dependent and -independent. 286, H2287-H2287 (2004).